The Trump administration last week abruptly canceled a solicitation for a private sector partner to help it hire thousands of deportation officers and support personnel, citing delays in obtaining the requisite funding. Immigration and Customs Enforcement vowed to move forward with awarding the contract in October, at the turn of the new fiscal year. ICE published the solicitation to support an executive order President Trump issued shortly after taking office, which called on the agency to hire 10,000 new law enforcement agents. The contractor would have assisted ICE in hiring 8,500 deportation officers and 1,500 criminal investigators and in the recruiting and onboarding of about 6,600 support staff positions. While ICE cited only a delay in receiving its fiscal 2018 funding allocation—Congress only approved the governmentwide omnibus spending bill in March, halfway through the fiscal year—the measure Trump signed into law did not provide for any significant hiring boost at the agency. The spending package included a 10 percent increase of $641 million to ICE funding, but it authorized the hiring of just 65 additional criminal investigations agents. 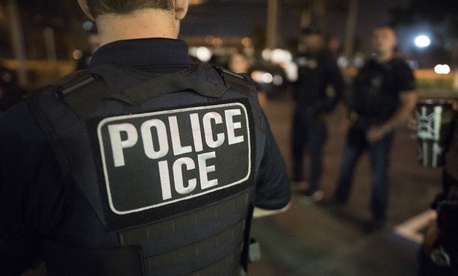 Trump’s budget had requested funding for 1,000 new agents as part of the president's mandate that ICE bring on 10,000 law enforcement personnel. The solicitation did not estimate the value of the contract, which would consist of one base year and the government’s option for two additional years. Customs and Border Protection recently awarded a similar contract to provide Accenture Federal Services up to $297 million to help it hire as many as 7,500 employees, which will enable the agency to meet another part of Trump’s order. If ICE moves forward with the contract next year and spends the same amount per employee, the contract would be worth about $657 million. CBP awarded its contract despite also facing pushback from congressional appropriators. Congress did not authorize any new hires at Border Patrol—where Trump has called for 5,000 new agents—in the recent omnibus, and instead provided $7 million for 351 customs officers at ports of entry. Lawmakers noted that “despite significant investments in hiring, retention and recruitment strategies,” CBP now expects Border Patrol to lose more agents than it will gain in fiscal 2018. “These reduced payroll costs are reflected in the bill,” lawmakers wrote in an explanatory statement accompanying the omnibus. ICE has struggled to meet its hiring goals, with the number of new deportation officer hires—where the Trump administration has envisioned the overwhelming majority of the new employees working—dropping in half in Trump’s first year in office to just 371. In his fiscal 2019 budget, Trump proposed funding for ICE to hire 2,000 new agents. ICE did not elaborate on the solicitation cancellation, but earlier this year Danielle Bennett, an agency spokeswoman, told Government Executive that the agency is taking a “multi-pronged” approach to fulfilling Trump’s hiring mandate and would be ready to ramp up if it received authorization from Congress.